On-site accommodation. Golf clubhouse with changing rooms, bar, restaurant and lounge. Golf practice facilities inc driving range, putting green and pro shop also on site. Golf del Sur, part of the Aymerich Golf Group, is a 27 hole Championship length golf course set in 800,000 m2 of land on the south of Tenerife Island (fifteen minutes from Reina Sofia Airport). The course with its big wide fairways fringed by palm trees, giant cactus and native flora looks like an oasis of green set against the dark volcanic rock of Tenerife. 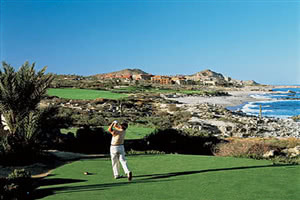 Golf del Sur has three loops of 9 holes allowing a mixture of play and with a combination of tees the course can be setup to challenge the best golfers in the world but also offer enjoyment to the less acomplished golfer. The quality fo the course is demonstrated by the fact that it has hosted the Tenerife Open, part of the PGA European Tour, and the Tenerife Ladies Open on several occasions. Three things to start with. It gets windy here. Don't use your best clubs out of the bunkers. If hills and heat aren't your thing then get a buggy. There are 27 holes, but during my time here the Norte 9 was closed for maintenance. The Sur and Links however were both open and well worth playing. Both have great views of the mountains and the coast, and while a number of holes have fairly accommodating fairways, there are a few which do not suit a driver. The greens were excellent, and the condition of the fairways and greens weren't far behind. There are a lot of very pretty holes on both sets of nines, and while low scores are possible, there are plenty of opportunities to rack up a big score too. The cost per round (in June) was €52, which is reasonable compared to a lot of Spanish courses. Three round tickets were available for €142, which brings the price down a little.